As the new year begins, there are no shortage of stories telling us what to expect in 2012. 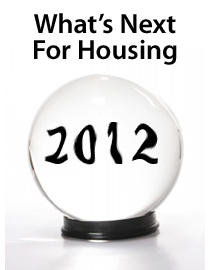 Housing finished 2011 with momentum and mortgage rates closed at the lowest rates of all time. Some expect those trends to continue through the first quarter and beyond. Others expect a rapid reversal. Who’s right and who’s wrong? A quick look through the newspapers, websites and business television programs reveals “experts” with opposing, well-delivered arguments views. It’s tough to know who to believe. The issue for buyers, seller, and would-be refinancers in Trabuco Canyon and nationwide is that it can be a challenge to separate a “prediction” from fact at times. When an argument is made on the pages of a respected newspaper or website, or is presented on CNBC or Bloomberg by a well-dressed, well-spoken industry insider, we’re inclined to believe what we read and hear. However, we must force ourselves to remember that any analysis about the future — whether it’s housing-related, mortgage-related, or something else — are based on a combination of past events and personal opinion. Predictions are guesses about what might come next — nothing more. For example, at the start of 2009, few people expected the 30-year fixed rate mortgage to stay below 6 percent, but it did. Then, at the start of 2010, few people expected the 30-year fixed rate mortgage to stay below 5 percent, but it did. All we can know for certain about today’s market is that both mortgage rates and home values are low, creating favorable home-buying conditions in and around South Orange County and nationwide. At that start of last year, few people expected mortgage rates to even reach 4 percent. Today, rates “with points” price in the 3s. What 2012 has in store we just can’t know.